Noel Kelly's Kids - Bill Brogan its a small world. 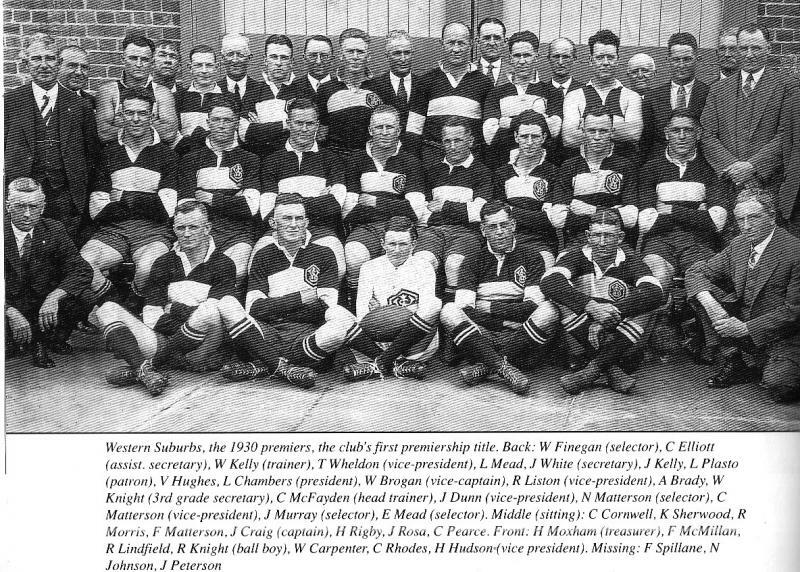 A photo of the 1930 Premiers.Bill Brogan is 9th from the left back row. Thats Wild Bill at the back. Bill and the 1930 Wests team at Campbelltown . (photo thanks to James & Alma McWhinnie) A friend I have known for many years Dom Boidin told me that his dad Keith Boidin was coached by an old footballer called Bill Brogan. 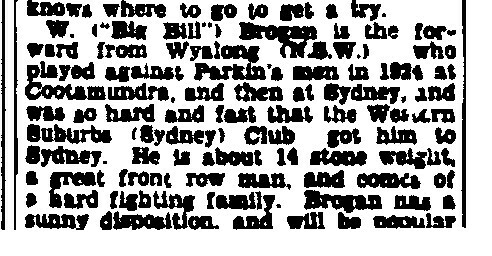 Dom said his dad called him Wild Bill BroganLittle did we both know that Wild Bill played for Wests and New South Wales and Australia.Bill was a very good professional heavy weight boxer who fought at the Old Tin Shed . C.Y.O.R.F.L.ST.JAMES FOREST LODGE1948 Bill Brogan middle back and a young Keith Boidin bottom left.Bills son Terry Brogan who went on to play for Balmain(1951-1955) is in front of his dad.Bill coached this team to a B Grade premiers and B Grade Champions of Sydney 1948. This newspaper clipping is from the Brisbane Courier 3 July 1929its part of a profile of the 1929 Kangaroos. 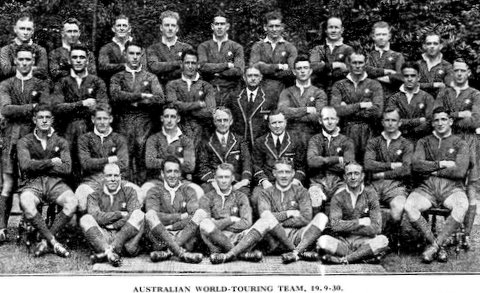 The Australian World Touring Team 1929-1930Bill is 3rd from right back row . Thats Wild Bill back left in the New South Wales side 1931.NSW beat QLD 39-17 at the SCG Bill Brogan joined Wests from Warialda in 1929 5 Wests players were named in the 1931 NSW side to play Queensland. (from left) Wild Bill Brogan,Cliff Pearce, Ray Morris(sitting) Ken Sherwood and Harry Owen. Albert (Keith) Boidin wins the W.Hickey Trophy Cup for Best and Fairest. Keith told Dom that Wild Bill was a great coach who was a fair but hard task master.With a great knowledge of the game of Rugby League. This newspaper story from the Canberra Times the year 1935.Bill was now the coach of Burrowa Keith Boidin and his lovely bride Beryl And about the same time this story appeared in the SMH written by the great Rugby League writer Tom Goodman. One of the newspaper clippings I scanned. 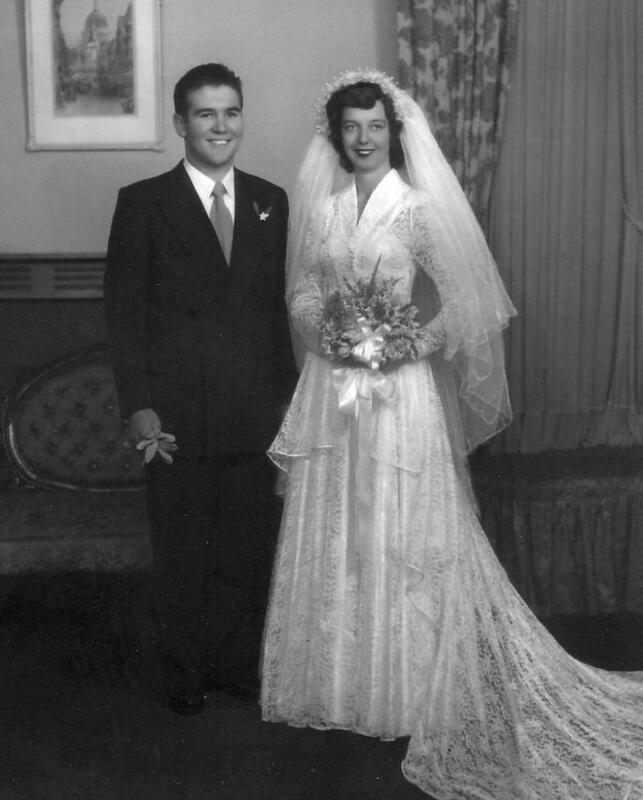 I received an email from Bill Brogan’s grandson Peter Brogan back in April of 2012 telling me his dad Terry Brogan was alive and would I like to speak to him about Bill. Unfortunately I could not make the trip to Maclean. Terry’s health was in decline so talking to him on the phone was impossible. Peter and I kept in touch and finally we met at his home at Yamba in early September 2012 ﻿ Wild Bill and his son Terry Brogan Maybe the same day . Small world again Peter was a year behind me at school we both went to Christian Bros Lewisham back in the 1960’s ﻿ A proud Peter Brogan holding up his Grand Fathers blazers. (I think Peter also goes to my barber) NSW Blazer Blazer PocketBill was born in 1900 that makes him 32 when he lasted played for NSW Kangaroo Tour Blazer 1929 Blazer Pocket Terry Brogan’s health is not real well so a visit was out of the question. My wife Lee and I had a great couple of hours with Peter and his lovely wife Marion talking about Bill, Terry and Lewo. Peter was kind enough to show me his grand fathers scrape book as well as team caps from the old days and Bills NSW and Kangaroo blazers. Kangaroo Tour cap 1929 NSW Cap 1924 ﻿ Not sure about this one can anyone HELP?? Guess what ??? I received this email today from Bill Tzimos. Hello Mr.Lewis, I happened to stumble onto your web site Noel Kelly's kids while looking for images of rugby league honour caps. I saw your article about Bill Brogan and read about him, you have some things that I have in my collection for the 1928 England V South cap. I send you a photo of Sid Hall wearing his 1928 cap along with a photo of one that I have in my collection and a copy of the programme from the match played 30 May, 1928 that you might want to pass on to the family. Kindest regards, Bill Tzimos Thanks Bill for the missing infomation. Because of Bill I can now add to the Mystery Cap Story. See Below.﻿﻿ Thanks to Peter I was able to scan and photo some of this Wests and Australian Rugby League History so it can be shared any enjoyed by everyone. I hope you all enjoy this story, photos and scans. Mr Bill Brogan Bill sailing for the Old Dart. ﻿ Team photo taken before last test match 1930. (I hope you can spot Big Bill by now) NSW players 1924 Bill at back left. Wild Bill also could box a little. Text from last scan. I think a program from the 1929-30 Kangaroo Tour?? 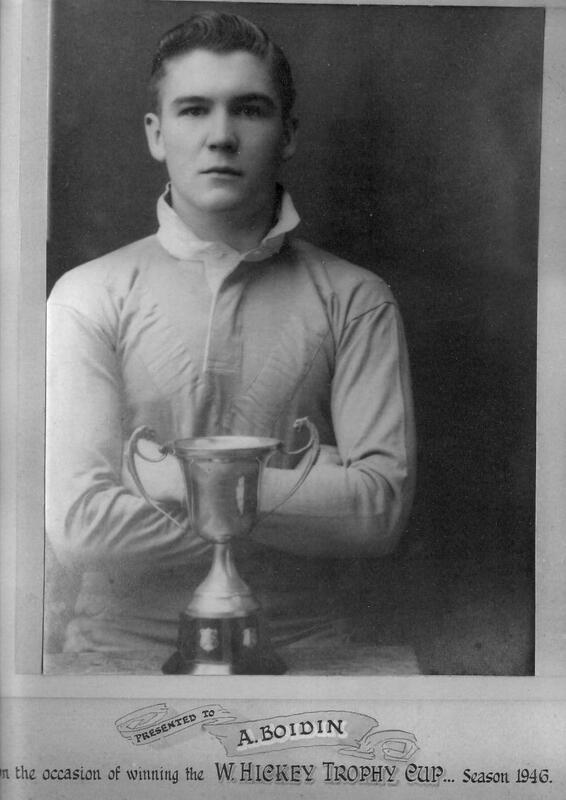 1933 the last year Bill Brogan played for Wests. Bill was also coach for part of the 1933 season. Wests lost 5 of their top players mid season due to 1933 Kangaroo Tour. Thanks again Peter for letting us share in your famlies rich Rugby League History. Bill Brogan its a small world. A photo of the 1930 Premiers. Bill Brogan is 9th from the left back row. Thats Wild Bill at the back. Bill and the 1930 Wests team at Campbelltown . Little did we both know that Wild Bill played for Wests and New South Wales and Australia. Bill was a very good professional heavy weight boxer who fought at the Old Tin Shed . Bill Brogan middle back and a young Keith Boidin bottom left. Bills son Terry Brogan who went on to play for Balmain(1951-1955) is in front of his dad. 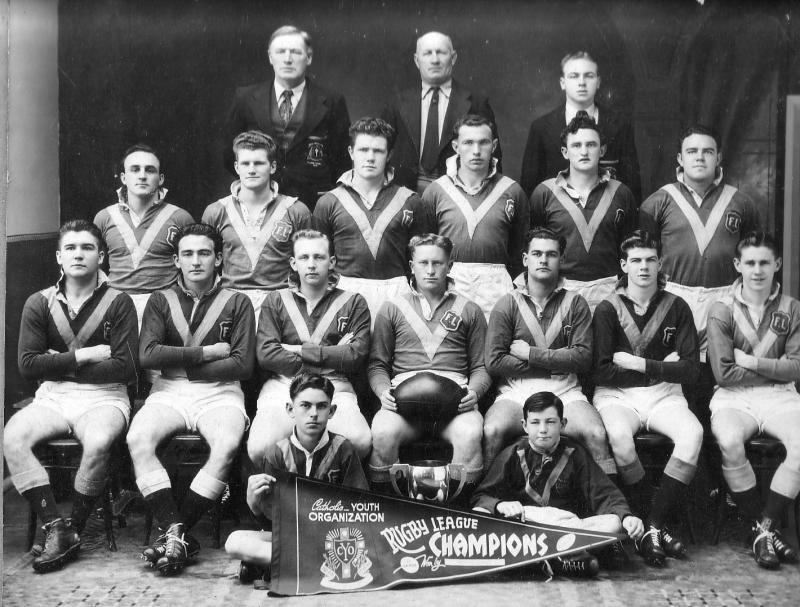 Bill coached this team to a B Grade premiers and B Grade Champions of Sydney 1948.
its part of a profile of the 1929 Kangaroos. Bill is 3rd from right back row . 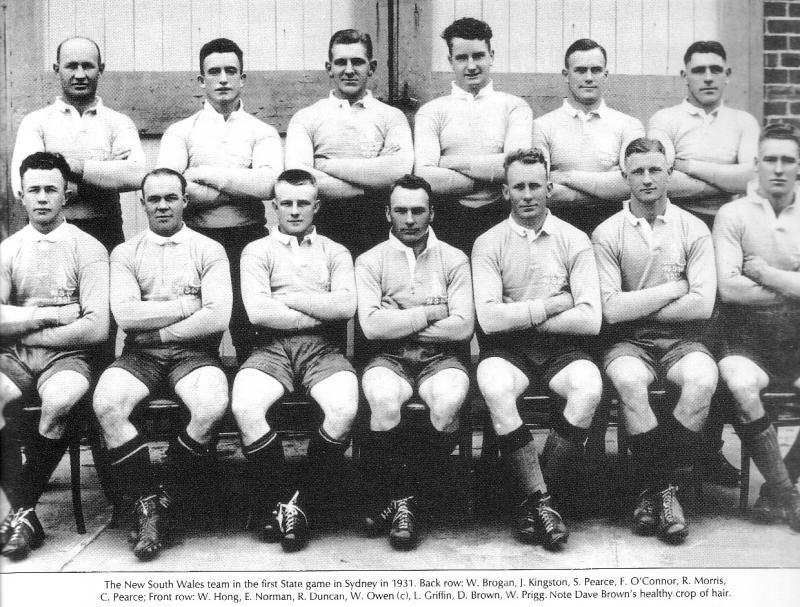 Thats Wild Bill back left in the New South Wales side 1931. 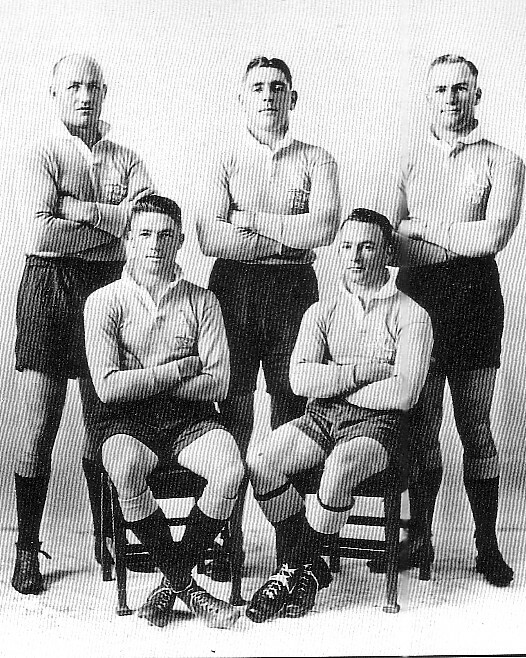 5 Wests players were named in the 1931 NSW side to play Queensland. (sitting) Ken Sherwood and Harry Owen. Albert (Keith) Boidin wins the W.Hickey Trophy Cup for Best and Fairest. Keith told Dom that Wild Bill was a great coach who was a fair but hard task master. With a great knowledge of the game of Rugby League. This newspaper story from the Canberra Times the year 1935. And about the same time this story appeared in the SMH written by the great Rugby League writer Tom Goodman. One of the newspaper clippings I scanned. I received an email from Bill Brogan’s grandson Peter Brogan back in April of 2012 telling me his dad Terry Brogan was alive and would I like to speak to him about Bill. Unfortunately I could not make the trip to Maclean. Terry’s health was in decline so talking to him on the phone was impossible. Maybe the same day . A proud Peter Brogan holding up his Grand Fathers blazers. Terry Brogan’s health is not real well so a visit was out of the question. My wife Lee and I had a great couple of hours with Peter and his lovely wife Marion talking about Bill, Terry and Lewo. Peter was kind enough to show me his grand fathers scrape book as well as team caps from the old days and Bills NSW and Kangaroo blazers. Not sure about this one can anyone HELP?? I received this email today from Bill Tzimos. I happened to stumble onto your web site Noel Kelly's kids while looking for images of rugby league honour caps. I saw your article about Bill Brogan and read about him, you have some things that I have in my collection for the 1928 England V South cap. I send you a photo of Sid Hall wearing his 1928 cap along with a photo of one that I have in my collection and a copy of the programme from the match played 30 May, 1928 that you might want to pass on to the family. Thanks Bill for the missing infomation. Because of Bill I can now add to the Mystery Cap Story. Thanks to Peter I was able to scan and photo some of this Wests and Australian Rugby League History so it can be shared any enjoyed by everyone. I hope you all enjoy this story, photos and scans. Bill sailing for the Old Dart. Team photo taken before last test match 1930. NSW players 1924 Bill at back left. Wild Bill also could box a little. I think a program from the 1929-30 Kangaroo Tour?? 1933 the last year Bill Brogan played for Wests. Bill was also coach for part of the 1933 season. Wests lost 5 of their top players mid season due to 1933 Kangaroo Tour.